The SnoAcademy runs alongside the school term time (12/13 weeks) and is a market leading and unique children’s club designed to coach and develop junior skiers and snowboarders. Snozone is the place to learn a new sport, develop your snow sport skills, or even set your sights on a future Winter Olympics! Children develop either skiing or snowboarding skills where the emphasis is on learning and development in a fun packed weekly session that really engages children in a true club atmosphere. Each individual level is rewarded through the signing of your child’s SnoAcademy booklet and certificates at the end of each term. The SnoAcademy operates three age groups: 3-6, 7-10 and 11-15 year olds. Each age group has its own session time running on both Saturday and Sunday mornings and during the week after school. Please note skiing is taught from the age of 3 years and snowboarding from the age of 7 years. New for 2018, our SnoAcademy AllStars programme is the next stage in learning to ski/snowboard. Replacing our previous SnoAcademy Excel programme, the AllStars is a unique, term-time (12/13 week) programme that coaches children from 3 to 15 years to a higher level of performance. Children who have attained our highest SnoAcademy award and graduated are now able to go and join the AllStars where they will continue their development through our advanced skiing/snowboarding and freestyle programme. If your child has not previously attended the SnoAcademy they will still be welcome to join the AllStars pending an assessment to ensure they are placed in the correct standard group. The SnoAcademy AllStars run on Saturdays and Sundays each week of the term. Children aged 7-15 years can keep fit, learn a or improve at a new snow sport, meet new friends and learn a brand new life skill at our acclaimed holiday camps! Each day is packed full of fun and is excellent value for money. Starting the day, your child will learn to ski or snowboard with our fantastic snow school coaches, followed by lunch in our Alpine Kitchen restaurant and then either head back out onto the slopes, enjoy some fitness drills or take part in a mini-medics session – an accredited first aid course for children. We have now also included sign language lessons into the warm side programme too! The camps are available for beginners or experienced skiers and snowboarders. Refreshments are included and Snozone members also receive a 15% discount! Our holiday camps run from 8.30am-5pm and can be booked by the day or full week. Half day camps are also available for children aged 3 to 6 years – please call us for more information on 0333 0030 520. 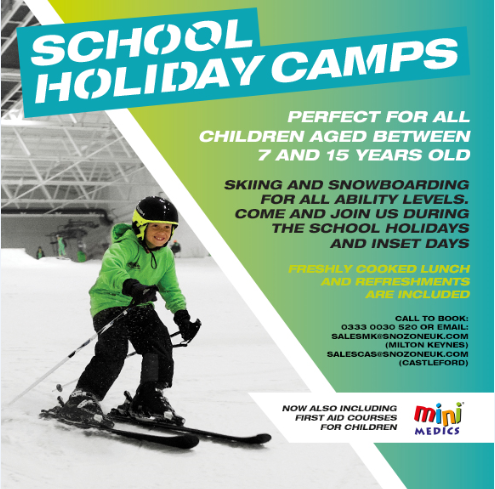 For more information about either our holiday camps or SnoAcademy, please email sales.mk@snozoneuk.com (Milton Keynes) or sales.cas@snozoneuk.com (Castleford) with your name, telephone number and details of your enquiry. We will contact you within 48 hours. If you would prefer to speak to one of our team, please call us on 0333 0030 520. Are you a Snozone Member? There are a huge range of fantastic savings and benefits available to Snozone Members, including priority booking for SnoAcademy and AllStar sessions and 15% discount for our holiday camps. View full Snozone membership details and prices here.